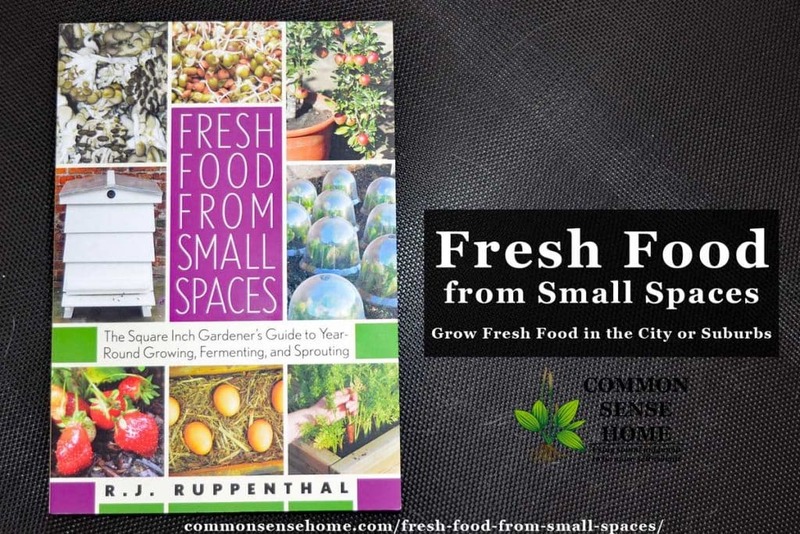 “Fresh Food from Small Spaces: The Square Inch Gardener's Guide to Year-Round Growing, Fermenting, and Sprouting” by R.J. Ruppenthal shows you how to grow food in small spaces with minimal inputs. 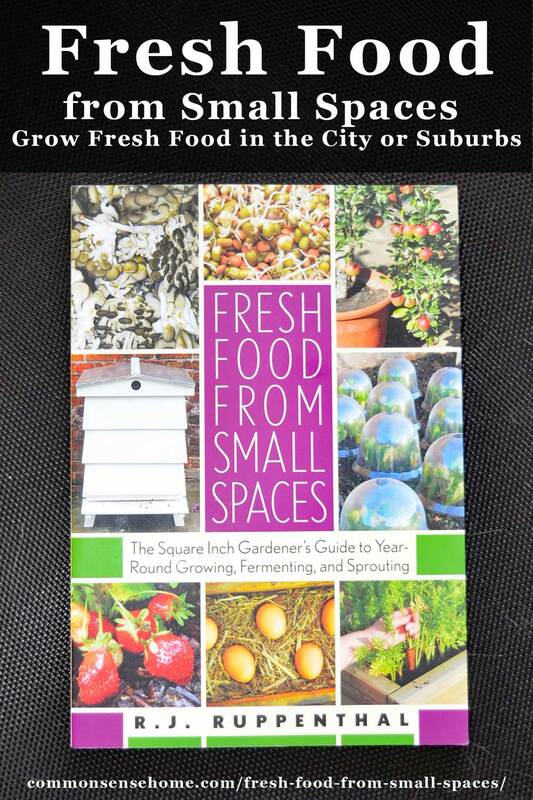 The author explores options from container gardener and dwarf fruit trees to sprouting and mini mushroom farms. There's a chapter on making fermented foods, which can help bump up nutrition without a ton of work. An introduction to chickens and honeybees round out the book. There are black and white photos, charts and diagrams throughout the book, plus an extensive resource section featuring tools, soil amendments and other supplies. The author states in the introduction that he searched for years to find a book on tiny space food production, with no success. This led to the book “Fresh Food from Small Spaces“. I felt the book really shined in the section on container gardening. I cringe at online “container gardens” where someone has obviously stuffed plants into a container that is way too small or difficult to maintain. You know it's going to look good for a week – maybe two – before the plants are overgrown or half dead. R. J. has tested a ton of different containers, and shares what works. He also offers detailed instructions on how to build a couple of different budget-friendly types of self watering containers. Another very helpful section was the way that he tackled sprout production. I found his discussion of different sprouting equipment and seeds practical and informative. The recipes utilizing sprouts sounded like people food instead of bunny food, and have inspired me to try new sprouting seeds. There were also tips for working with less than optimal outside lighting to boost crop production, which is very important for many people with limited growing space. Recommendations were included for full sun, part sun and full shade conditions. I could have skipped the lecture on peak oil, and the preparedness section seemed a little out of step with the tone of the rest of the book, but overall I feel it's a very practical guide to small space food production. Relocalizing food production is critical to building a more stable and nutritious food supply. As August and I wrote about in Future Food, and the author notes in “Fresh Food from Small Spaces“, one of the best things we can do to create a more sustainable future is to grow food – any food. If everyone grew just a little something, we could dramatically change the food landscape for the better. If you buy what you can't grow directly from local farmers, that money goes right back into our communities. Thank you for sharing your blog post. I have just a small strip of dirt to plant my garden. There is enough harvest for myself to enjoy fresh vegetables all summer. You are right that you can grow food in a small area. Your post makes me long for spring and to get back to the earth. We have had our share of snow this winter here in Vermont. Not too much longer now!